J”adore, la preuve c’est que j’ai atteint ce niveau. Bravo à l’équipe et bon courage aussi. Oh well, let’s try this impossible level again. 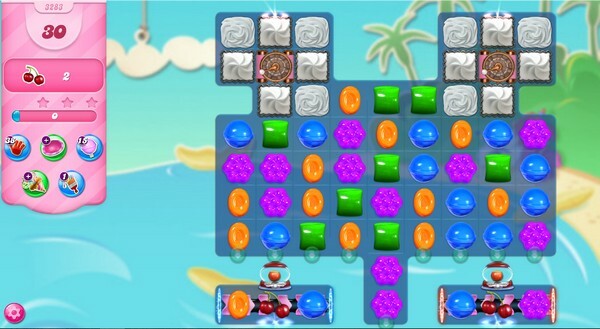 Struggling with this level!! Could use some help.Thanks for listening.It is very much appreciated. Can’t be done without more moves! This is totally i achievable! Why bother? Without a lucky board, can’t be done! What is preventing u from fixing this? Practically every level is unfair and frustrating! Very hard level. Seriously thinking about uninstalling the game altogether. I guess I am a little dense on this level. First of all, the only thing I can figure out is the way the video was lucky and one cherry came straight down and out. I cannot get rid of the blockers to get the spinners…stripes are always in the wrong place. When I get the ingredients to the bottom, I don’t know how they got there and I don’t understand how to get them out. To get to the point, I NEED HELP OF SOME KIND VERY BADLY. HELP, HELP, HELP. THANK YOU.